San Jose is the location for the first citizen science association meeting, on the 11th and 12th February. The level of enthusiasm to citizen science by researchers and practitioners was palpable, even well before the conference – the conference organising team were coping with an overwhelming number of submissions and abstracts that they needed to fit into a two days programme. In the end, the conference run with 7 parallel sessions, and many posters in the reception session on the first day, as a way to allow as many participants to present their work. As can be imagined, what you read in the rest of this post is just 1/7 of what was going on! Rick Bonney (who was elected as the treasurer of the association just the day before the conference) started with emphasising the reasons for having the Citizen Science Association (CSA): learning from others, developing synergies between projects and sharing information collaboratively, so we can start to solve wicked problems society is facing by finding the answers that we need, together. He noted that the CSA now got 3000 members, a new journal Citizen Science: Theory and Practice and the conference have almost 650 participants. The opening talk ‘A Place in the World – Science, Society, and Reframing the Questions We Ask‘ was given by Chris Filardi of the Center for Biodiversity and Conservation, American Museum of Natural History. Filardi, an evolutionary biologist by training, has been recognising the importance of wide participation in science in understanding our place in the world. He started his career by going to New Guinea to study birds in remote places. Though interaction with villagers in the highlands of New Guinea he learned that science dependent on a sense of purpose and understanding the set of relationship that people have with their natural environment. Over the years, he started realising that many of the datasets that he was using are coming from citizen science, and wouldn’t be there with out the effort of the volunteers. He admits that he is new to the field, but what he noticed the lively discussion around the definition. Once he read Alan Irwin’s citizen science he found the explanation that he liked, which is seeing citizen science as that point where analysis and intervention meet each others – and it was huge personal discovery. As scientists, there is an amazing wealth of knowledge that is born from local systems – social systems that deal with the local environment. But scientists are preaching from their own pedestal . If we engage people in the full life cycle of science, we can get a more meaningful relationship between science and society. There is so much as citizen science and society that were revelationary to him. Citizen Science helps in exposing obvious things. It helps to reframing the questions that we ask – as examples from working with indigenous people on their relationship with the forest, which also linked to the preservation of grizzly bears demonstrate. Citizen Science is a touchstone in linking science and other perspectives – when they are involved in the full life cycle of science, allow to notice pre-existing values and practices that can get to the right results when it’s the community that helps to lead to the wished-for results. Conservation and evidence can help in providing community evidence that will allow them to improve the protection of their environment. By working in participatory way, we can get better results. Citizen Science also reveals risks worth taking – scientists are scared of bringing people who are not trained scientists into scientific projects and should learn to do so. Engaging wider audience in data collection can lead to risks – for example respecting areas that are taboo for local people, which sometimes are protected through such mechanisms, and not insisting on exploring them. Need to consider the costs of insisting on science – carrying out a survey in an area that the community decided not to go to because of their beliefs. Science in the name of evidence can harm relationships – we need to know when science need to step back. Citizen Science can link talk, action and symbol – so the social discourse, the actions and beliefs and help in dealing with some of the challenges that we have as a society. Sometimes there are risks for the scientists itself – stating that there was a compromise the scientific process because of local beliefs can be problematic amongst scientists. The discussion that followed the talk also led to mentioning participatory action research and participatory science as names for the topic. The second session that I attended was 1D Re-Imagining Citizen Science for Knowledge Justice — A Dialogue with Tom Wakeford, Alan Irwin, Erinma Ochu, Michel Pimbert, and Cindy Regalado. The session was organised as a dialogue in groups of 8, with several groups in the room and linking. The dialogue run as a facilitated discussion of the Questions That Won’t Go Away (QTWGA) in participatory action research which Heidi Ballard recently identified – and how to either solve them or learn to live with them. The groups explored the tensions and challenges in the practice of citizen science, and how these have been resolved, or lived with. This was follow by imagining what the vision for citizen science should look like. 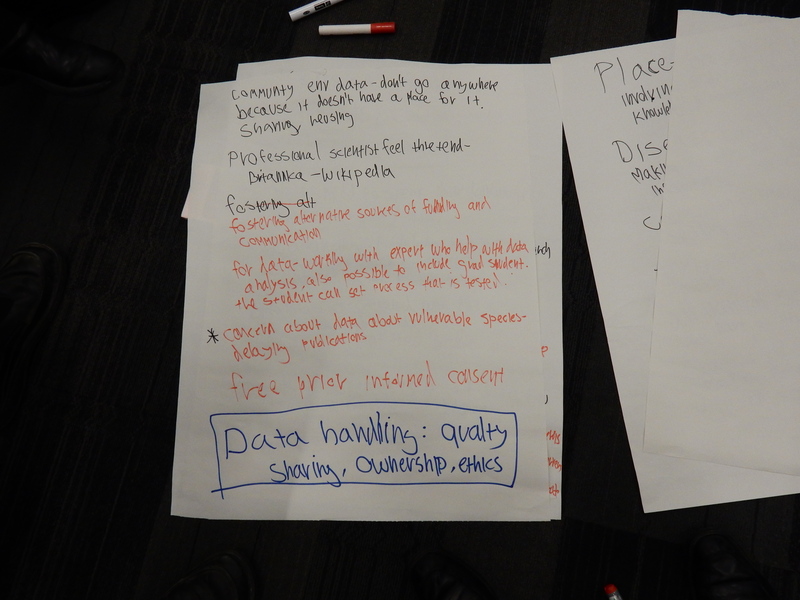 The group that I found myself impromptu facilitating identified data handling which includes understanding quality, sharing of information, ownership of data and ethics as a major issue in citizen science that won’t go away. Other groups challenged the term ‘citizen’ both from scientists and participants perspectives . The need to understand the ‘citizen’ side demands respect to people financial resources and thinking about compensations – are we treating participants properly and going beyond free labour. Another issue is how expertise are defined – different types of expertise from scientists and participants, and how they can be negotiated. For example, when research is done with communities, it is important not to further stigmatise communities and also to feel obliged to provide information back. A second round explored the vision for the future citizen science. In my group concepts of place-based citizen science or in the medical field, a disease-based citizen science were proposed – a lot of attention on community focused and based research with issues that are set by the community. There was also wish for truly collaborative citizen science with decision makers, industry and scientists. An idea that was raised is to educate natural scientists to do citizen science as part of their training and also seamless collaborations with the data being properly used and citizen science that is funded for long terms. The next session that I attended was 2G Talks: Tackling Grand Challenges and Everyday Problems with Citizen Science. The first talk was by Gianfranco Gliozzo from ExCiteS , titled Using Citizen Science to evaluate the cultural value of biodiversity (co-authored with Elizabeth Boakes, David Roy, myself, and Chloe Smith). Gianfranco described a project that is funded by UCL grand Challenges of Sustainable Cities programme. The study looked at cultural ecosystem services – the inspiration from nature that people receive and influence their wellbeing. The approach is especially focused on learning from citizen science data about the cultural services from the environment. The project is specifically looking at data in greater London, which have almost 50% of the total area as vegetated space. The data is from iSpot, iRecord and GiGL. So far, they found that there is emphasis on birds and flowering plants in terms of taxa. The study also looked at spatial patterns and starting to identify the heterogeneity in data collection with some hot spots of more activity. The conclusion so far is that there is a lot of value in integrating citizen science data and understanding the patterns but this is challenging, and also to appreciate the diversity of data sources and their contribution to the total information. Karen James discussed Combining Citizen Science and DNA-Assisted Species Identification to Enable “A New Kind of Ecology”. Karen opened by explaining that there is a challenge to identify the taxonomic classification of a species during citizen science activities. There are tools such as leafsnap (to recognise patterns of leaves) or wildlife acoustics tools that help in the process, but identification and classification remain very challenging. She specifically focused on DNA barcoding which allow to extend expertise – the barcode of life is a website that is dedicated to this. DNA identification provide further validation. There is an effort to create a library of DNA sequences of species. She demonstrated the potential of identification by using DNA of invasive species. She also see potential in engaging DIY bio enthusiasts in doing this work. 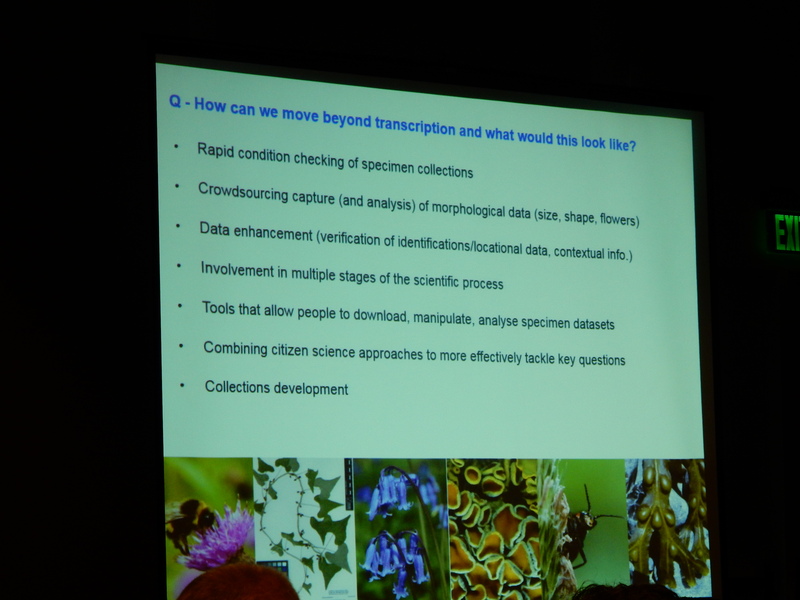 John Tweddle talk Beyond Transcription: Realising the Research Potential of Museum Specimens Through Citizen Science (co-authored with Mark Spencer, Lucy Robinson) discussed work at the Natural History Museum (NHM) in London. NHM have extensive engagement in citizen science, from molecular biology to field work. John focused on unlocking the collection of the museum – they have 3 billion specimens and metadata for it. It’s a treasure trove of information – and most of it is locked away. There is an easy way to take pictures of specimens, but the metadata is hand written, so there is an interest in crowdsourcing of preparing the data for further analysis. However, there is so much more that volunteers can do, beyond the transcriptions. John suggested to move forward – to engage participants in measurements, and further information from the digitized specimens. There is also a potential to add place-based knowledge to enhance the information in the collection, and then design new projects and enhanced them. He used an example from the Robert Pocock Herbarium project started by amateur historians, but once they came to the museum, they got engaged in classification, so ended with a community led project for backtracking where the specimens were collected, and add contextual information. Alison Young talk Acting Locally and Thinking Globally: Building Regional Community around Citizen Science to Broaden Impacts and to Create a Scalable Model (with Rebecca Johnson) covered the work of the California Academy of Science (CAS) is focus on biodiversity and is focused on research, with 45 million specimens. CAS considered how they can engage citizen scientists in the same way that they work with researchers – they aim that their citizen science will be used for both research and for managing biodiversity. They started with Mount Tamalpais, with an aim of creating a benchmark and record the biodiversity in many ways, including adding specimens to the herbarium. They are defining their community as the citizen scientists, those that might want to use the data (scientists and government), practitioners and organisations and groups that are doing related work. They are relying on iNaturalist as part of their engagement plan and consider also grass-root bioblitz that people can do it more easily then full ones. The ability of people to come and document species with iNaturalist in something close by is valuable, and people engage in a short exercise of just few hours. Nerds for nature are helping in establishing rapid bioblitzes. As part of session 3A Speed Talks – Across Conference Themes, Simon Lambert (Lincoln University) covered Indigenous Peoples as Citizen Scientists. Simon is from New Zealand and talked about Mauri in joint projects. He noted that there is lack of first nation people in many conferences and meetings. He talks about the people from which he came, he worked with Mauri for some years. There is a history of science in which people where treated as specimens and working with them requires to recognise this history and view of science. There are issues at the global level that recognised indigenous people in international agreements such as CBD, TRIPs and UNDRIP so asserting themselves is challenging for indigenous group and sovereignty – saying no to any science project. Good science comes from great politics – inclusive, ethical, acknowledging First Citizens as First Scientists – pushing into the social sciences to affect change. In session 3G Tackling Grand Challenges and Everyday Problems with Citizen Science Christian Adams covered Google Tools in From the Ground to the Cloud: Groundtruthing Environmental Change (co-authored with Tanya Birch, and Yaw Anokwa). Christian focused on the technology. Data collection in the field – paper got both upsides and downsides. Technology provides a lot of the issues with paper – Open Data Kit or ODK provides the ability to collect data in the field. It is an open source project. ODK got forms, then collecting and then managing and analysing it with Google Map Engine and Google Earth Engine. ODK got a tool to build forms and it also got a sensors framework. ODK aggregate allow to share data in a spreadsheet or in fusion tables which then can be visualised on maps. The final talk in the session was Public Lab: Open and cooperative structures for community-based environmental health monitoring by Shannon Dosemagen. Shannon covered the work of the Public Laboratory of Open Technology and Science, she looked at the process that Public Lab established to work with community. Shannon described the new tools that were emerging at the time of the BP oil spill in 2010. The analysis of barriers for community based environment science and health – the tools that are used are expensive, they are aimed at expert users to be able to interpret the results. Public Lab try to engage people in the full data life cycle and provide everything that is needed from development of the tools to the use of the results. At the heart of the activities are the social activities. The combination is low-cost hardware + collaborative web software + visual data that can help people to understand them + public archive so everything is accessible + you. They created open space that allow people to share experience. She demonstrated the web tools – first, a collaborative writing efforts and individual research notes that are tagged to bigger bits of information. They encourage people and recognise the contributions that people made. They maintain many emails lists that are localised and place based. They got 65 organisers that integrated the tools of public lab in their area. There is also places – to highlight the local connections. They treat participants as researchers, they also build openness into the process – so the physical link between the balloon and the operator is allowing for social interactions. The barn raising is also valuable event in the public lab calendar and it is about people coming together. Another ways to add value is mainstreaming true accessibility by linking imagery to Google Earth to make it accessible. The also protect openness with viral licensing so share alike licences are central. They also allow local version of hardware and tools. Third of the organisers are associated with higher education institutions. calibration is another issue that public lab are working with research institutions to test the tools. The symposium or panel covered the technical aspects of DIY aerial photography. 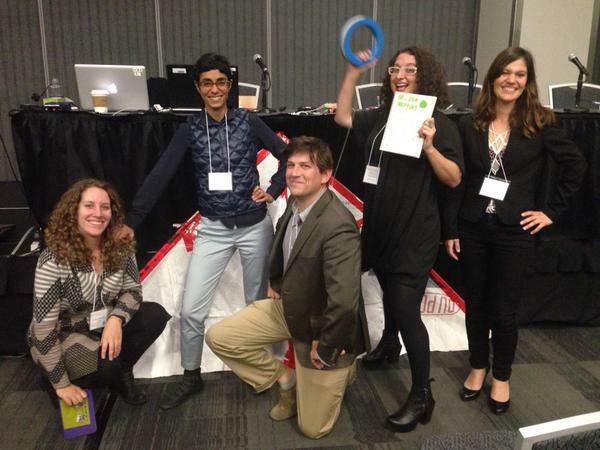 Public lab aim to create DIY, low cost (below <$150) tools that can be used by different communities. The basic components are also provided as set of tools that can be build easily, and tutorial, guides, hand drawn instruction. People can take any design and change it, but ask to share it back and continue to develop it. People use aerial mapping across the world – MapMill is an image sorting site, which is based on good/not image and MapKnitter that allows the integration of images into it. There is attribution to the people who collected, classified and stitched the map. Finally, they use print publications to share the data with other people. Scott Eustis described his work which is aimed at understanding where people want to manage their wetlands – it allow a way to link the people who know the land deeply. The effort is about 3h field trip and 2h to turn it into useful map. Going out after rain events to record the location of water helps to communicate the authorities about which places are flooded and causing problem. He highlighted the ability to ‘eye ball’ statistics but most of the cases only little information is needed apart from the image. With near infra-red there is also ability to see information about growth of plant and their health. Lila Higgins describe her additional interest in the Los Angeles river – a lot of people don’t know that there is a river there. The balloon mapping was aimed to increase recognition. The river became invisible – in the early 1900 during storm event it was causing collapse of houses with major property loss. To deal with that, they crease a concrete channel in 1938 – the river was concritsie in the 1960s. Most people see the concrete view, but there are people who saw different option for the river. Activists navigate the river with kayaks through the 51 miles and then EPA declared it as under the clean water act. The aim is to make it shared space. They started to use Google Earth to pick a section of the river to carry out a blue balloon over the river, and started to use the mapping to build a community. They are documenting events that are promoting the use of the river. Maria del Carmen Lamadrid, looked at eviction stalling mapping in Uganda. The balloon mapping was aimed to assist people who faced a threat of eviction in Feb 2013. Some people where using the area for over 20 years. The market was mapping in November 2012, when the police came to evict the residents, the evidence was used to prove that the place is used in a valuable way. The project asked question about self-representation and how people use tools that can allow the people in the area to control the data collection. Aerial mapping was combined with stills from the ground to tell stories about the area. Land issues are complex in Uganda with tension between different tenure structures, because some official data and tools such as google maps didn’t show the level of use of the market, the balloon mapping provide their rights. In the end, the place was evicted, and they created a map that show the eviction. Although the project was successful, it helped in terms of empowerment and gaining control over the process. They were treated as equal during the process. Hagit Keysar looked at two use cases in east Jerusalem as an activists and researcher, looking at recording and document human right abuses, so accountability by the communities itself. Of the 60% of Jerusalem population live in east Jerusalem, and of them, 40% are Jewish and 60% Palestinians. There are regular surveillance balloons by the authorities in the area on a regular basis – what’s the role of DIY aerial photography in this context? The Silwan village outside the old city is contested, and a map was created with information activists in the neighbourhood – they wanted to free themselves from dependency on human right organisations or the UN which don’t provide suitable information. By annotating the information by personal stories. The details of the imagery – allowing to have satellites above their own neighbourhood – providing information that Palestinian cannot access due to local restrictions. The second case is in Beit Safafa and the impact of a 6 lane motorway that cut through the neighbourhood, a discriminatory urban planning practice. The community activists use the aerial photograph to explain the issues when he presented the information in different places. The photograph is not a map – it’s a testimony, something real that make a difference. The maps that were provided were not making the damage to the community legible, so it provides a testimony to the damage – for the person who look at the image, they can understand what the abuses are. The final session of the day included the poster session, and provided me a unique opportunity to finally meet Louis Liebenberg and to hear about CyberTracker from the person who led it since 1996.